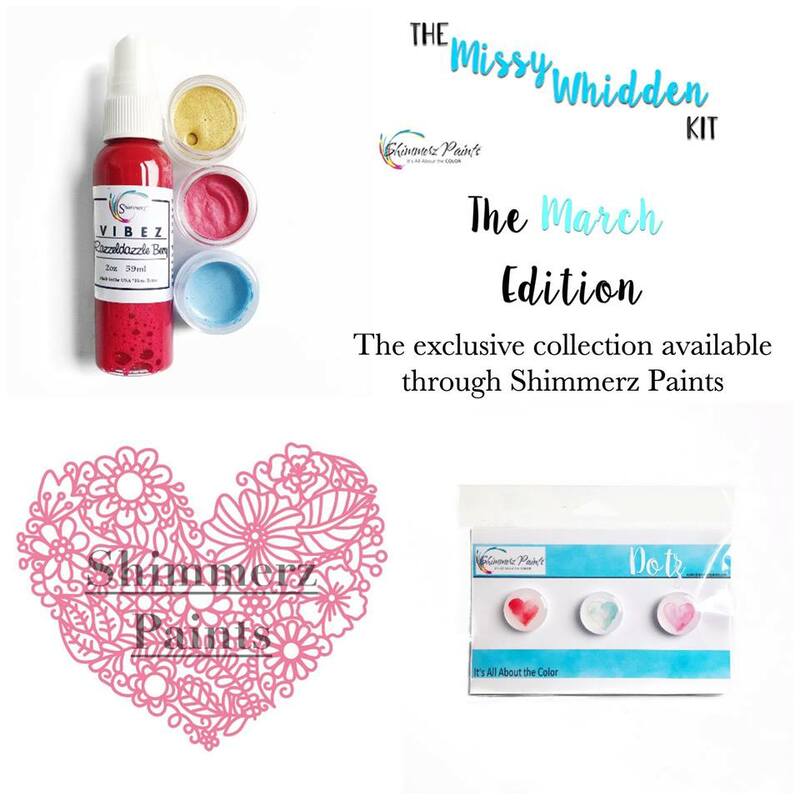 Shimmerz Paints: The NEW Missy Whidden Kit! 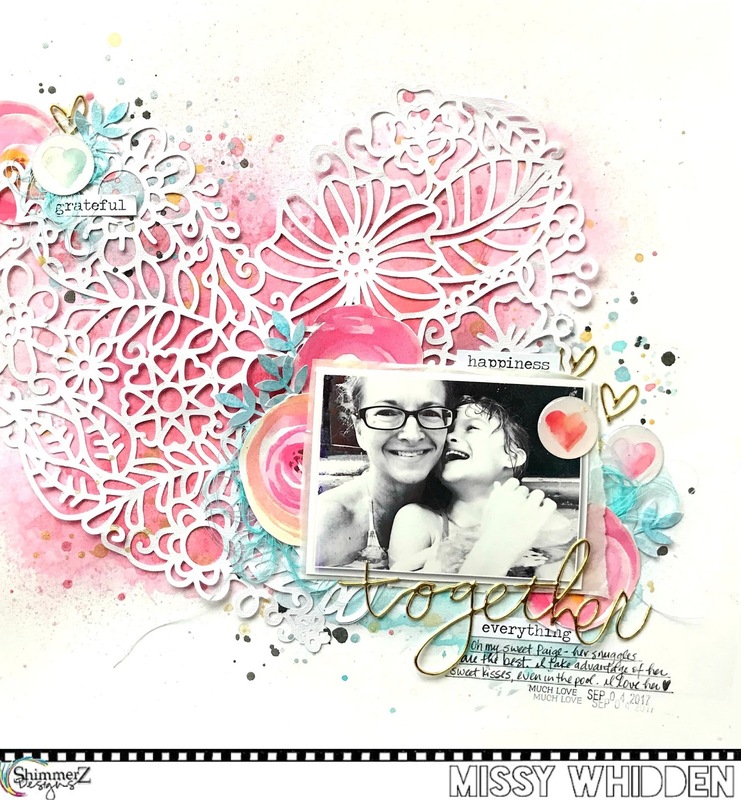 The NEW Missy Whidden Kit! It also contains a NEW product...Dotz! They are adorable epoxy buttons. These feature beautiful watercolor hearts! The kit also has an exclusive cut file designed by Paige Evans!! Yes! 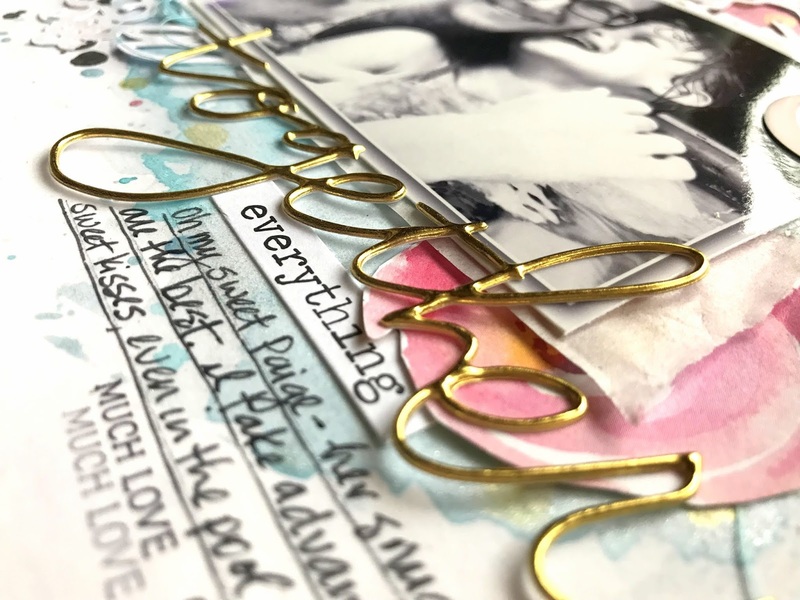 She has partnered with us to create a cut file each month. You get access to download it when you purchase the kit. The kit is $17.95, which is a steal! You'd pay way more than that if you bought these products individually. I hope this excites you as much as it does me...woo hoo!! Here's a layout I created using the new Kit. 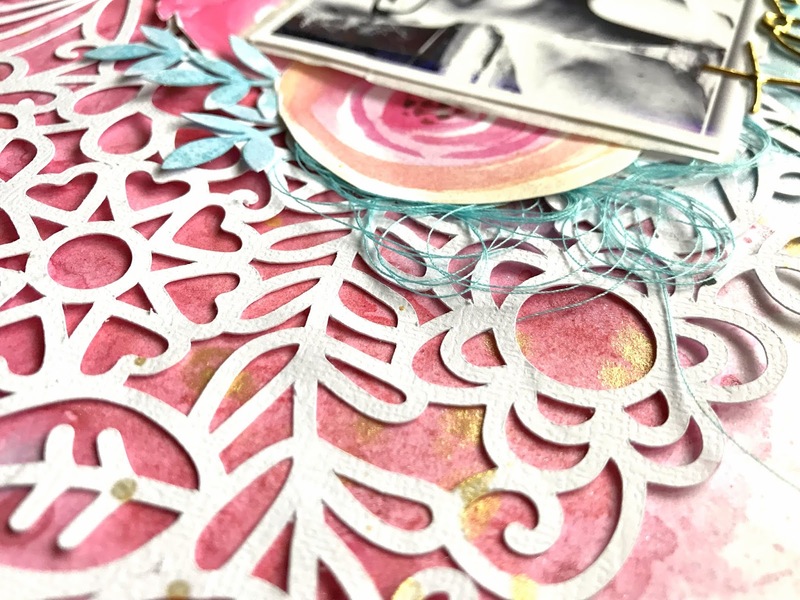 I cut the beautiful flower heart on white cardstock first. 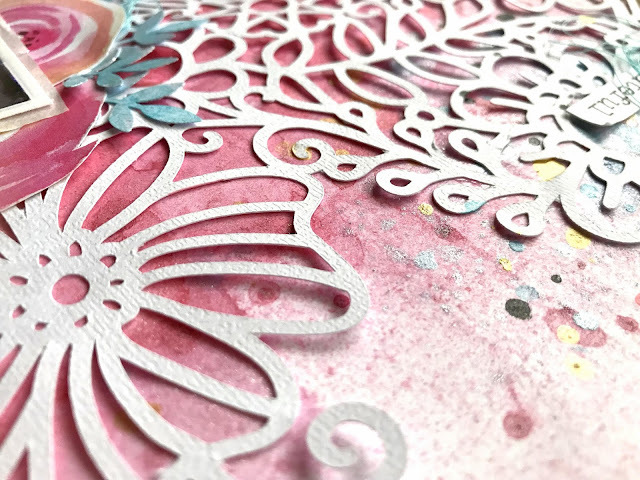 I decided to use lots of color on another sheet of white cardstock and let the cut file shine on top of that. I coated the background with clear gesso first and then went to work with the color. I began by spraying some Razzeldazzle Berry first. I spritzed it with water and just let the color run. I added some splatters of Red Necking and let it blend. I tilted the page so the color would spread. I came in next with the Colder Than Ice to add some blue. I did pull two extra colors from my stash for come color variations (Vibez Jeni B Bleu & Vibez Sweetheart). I kept working on the background by adding color and letting it dry. I also added in some splatters of the Miner Miner 49er, which is a gorgeous shimmery gold. Here you can see it shining in the light! I fussy cut a few flowers from a Webster's Pages paper and tucked them in around my photo. I also added some blue thread. I created a little cluster up in the upper left area of the design. 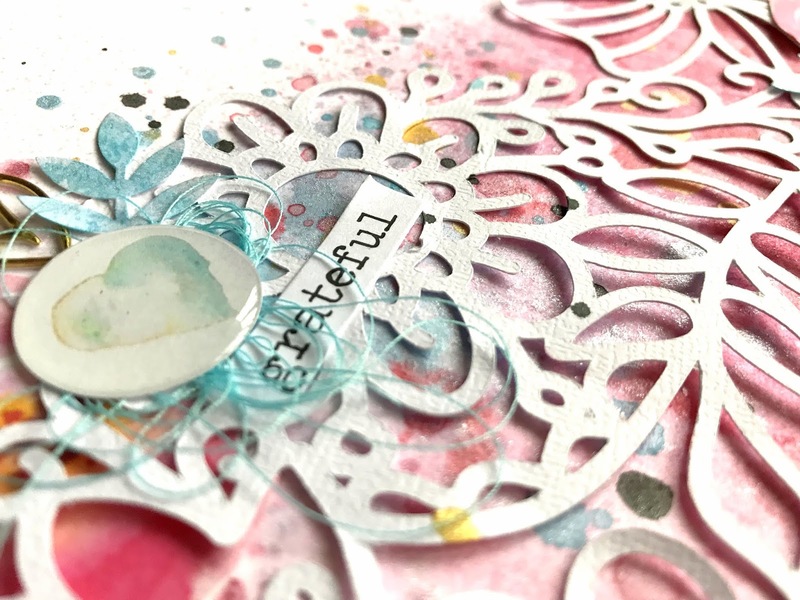 I used the blue Dotz here with some tangled thread, a punched leaf and a sentiment sticker. 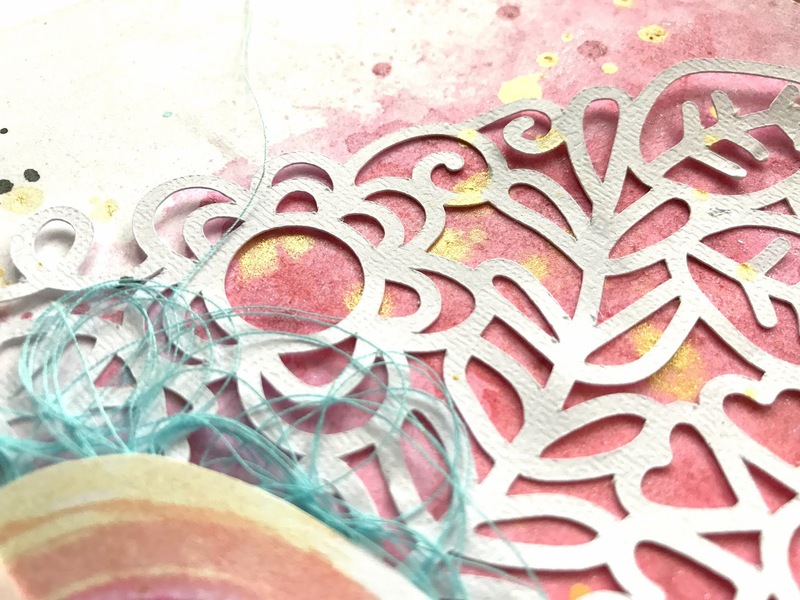 I punched some leaf stems from white cardstock and painted them with Colder Than Ice and a touch of Jeni B Bleu. I never get tired of seeing the gorgeous shimmer of these paints! And look at the detail on this cut file. There are so many possibilities with it. I left it blank, but you could also back it with paper and it would look amazing. I think the gold looks so pretty here on top of the pinks. 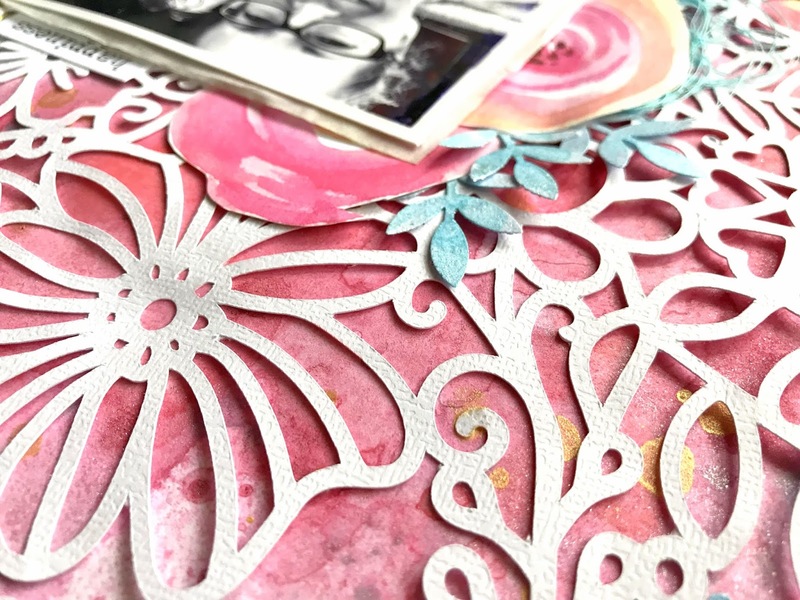 More details here...I wanted a pop of blue here amidst all the pink, so instead of searching my stash for something blue, I just made my own embellishment with the leaf punch. I used a new Heidi Swapp puffy sticker here for my title. It matched perfectly, and I layered it over the very bottom of my photo. I hope this gives you some fun ideas to try on your next layout! Be sure to check out the new kits HERE. There are also two other new kits up for grabs to day, so there are lots of new goodies to play with. Here's my video showing you more of the contents of the Missy Kit, plus the process of this layout. Thanks so much for stopping by, and I'll see you next month with a new kit! Have a great weekend! Yeah! She's a great inspiration. 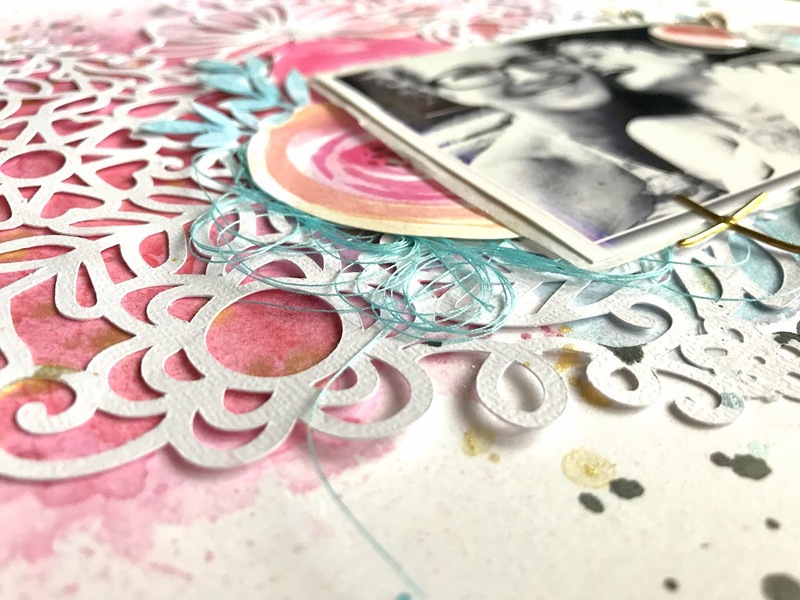 I love to see her creations and I'm constantly amazed at her playing with paper techniques. Each one is a masterpiece. Congratulations Missy.